Miriam Goldberger is the Founder & Visionary of Wildflower Farm, one of Canada’s oldest and largest wildflower seed companies. Miriam's passion for wildflower beauty and botany has been shared with The New York Times, Canada A.M. The Boston Globe, The Weather Channel, City-TV, Garden Making Magazine, Chatelaine Magazine, House and Home, The National Post, The Globe and Mail and Canadian Gardening Magazine. "Miriam Goldberger is a walking wildflower encyclopedia whose passion for native plants is contagious! In Taming Wildflowers, Miriam combines her enthusiasm and extensive knowledge with a smorgasbord of inspired and unique ideas. This new take on wildflower gardening is a must for anyone who wants to grow wildflowers or escape into the serenity and natural beauty native plants provide." - Niki Jabbour is a prolific garden writer and author of The Year Round Vegetable Gardener. "Miriam Goldberger has long been the prime voice for wildflowers and how they make the ecosystem hum. Now she's written a book about her wildly floriferous passion, filled with fresh photographs of wildflower gardens and bouquets. Taming Wildflowers will inspire anyone who loves these amazing and intricate plants and will entice a new generation of gardeners to fall in love with wildflowers." "I have known Miriam through her work in the business of wildflowers for about 20 years. I have grown to admire her passion for wildflowers and the depth of her knowledge of this fascinating topic. She has achieved what no other professional in the business has achieved: a level of awareness about the benefits of native plants that is unprecedented. The industry owes her and her partner Paul a debt of thanks for bringing more Canadians to the market. Miriam has kicked Canadian gardening up a notch." - Mark Cullen is Canada's best known gardening personality and author of many books including: The Canadian Garden Primer, The New Greener Thumb and Canadian Garden Design. "A few years ago, I had the pleasure of visiting Miriam (and Paul) at their Wildflower farm in Coldwater Ontario. In good company with numerous birds, butterflies, bees and countless pollinators, we strolled through fields of Liatris, Echinacea, Rudbeckia and many other incredible native plants. It is an experience that I will not soon forget. What was even more memorable was watching and listening to Miriam talk intimately about each and every species. I soon realized that she had a connection, admiration and understanding of these plants far beyond their obvious beauty and ease of culture. To know that Miriam has now put both her passion and many years of hands on experience into words in her upcoming new book is very exciting indeed! I can hardly wait to reacquaint myself with wildflowers through her passionate eyes!" "Miriam Goldberger has devoted a lifetime of work to propagating native plants and advocating for their widespread horticultural use. 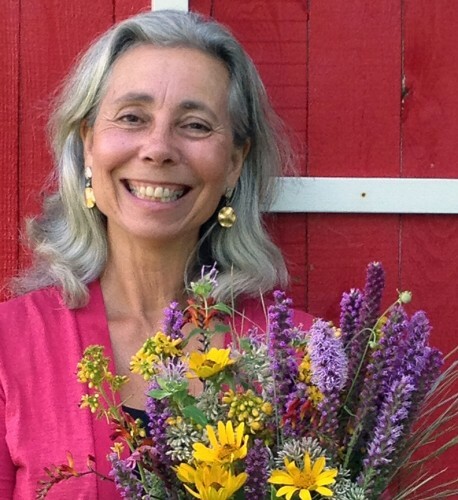 Through Wildflower Farm, she has not only made North American native plants widely available to the masses, but also educated gardeners about which plants grow best in which environments and why native plants are integral to the success of healthy ecosystems. Taming Wildflowers promises to build on her important legacy and continue to inspire others to share in her love of our native flora"
"Miriam Goldberger is a well-known champion of native plants and has been a professional wildflower grower for over 25 years. Her mission is to encourage as many people as possible to grow, design, decorate, arrange and love the flowers that have inspired her passion. It’s easy to get gardeners to welcome native plants to their own backyards – they sell themselves with their beauty, sustainability and as vital constituents of our local ecosystems"